The Borg level is essentially an introduction to the game. I would even call it a tutorial, except that the game already has a tutorial (which I skipped.) The combat is very easy, with the only enemies being slow-moving and mostly using close-range attacks. The health and weapon energy dispensers are plentiful, and will slowly recharge if they are depleted. As far as I know, this happens nowhere else in the game. I should take this opportunity to give a brief overview of the major characters that were carried over from the last game. 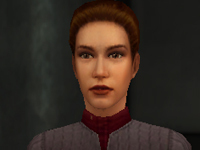 Picures from the Memory Alpha Wiki, bios from the Star Trek Voyager: Elite Force Player’s Manual. Skills: Munro possesses sharp reflexes, excellent combat abilities, and strong leadership skills. Munro’s initial assignment will be Infiltration Specialist. This position will utilize Munro’s natural scouting abilities. 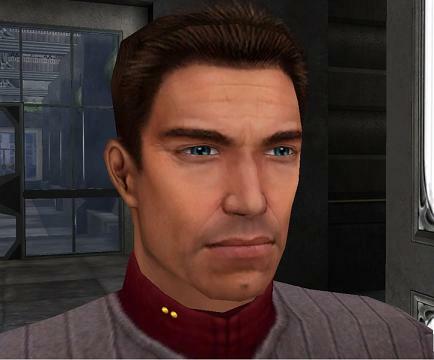 Psychological Analysis: Ensign Munro is a stable individual and is an excellent prospect for second command of the Hazard Team. In addition, Munro has demonstrated a surprising grasp of logic for a human, by devising clever improvised solutions to obstacles during several field missions. Psychological Analysis: Telsia has demonstrated a near Vulcan mastery over fear. She is a stable crewmember who will make a valuable addition to the Hazard Team. Skills: Strong mechanical and technical expertise. Extensive knowledge of alien cultures. Skills: Superior proficiency with explosive ordinance. Austin Chang is a logical choice for Team Demolitions Specialist. That Bolian’s voice is annoying, it would make me wish for a friendly fire option. Yay! My first non-spam comment. I have a real blog now!